French President Emmanuel Macron is blaming Iran for a ballistic missile launch by Yemeni rebels targeting Riyadh last weekend, and said it illustrates the need for negotiations with Tehran over its missile development. 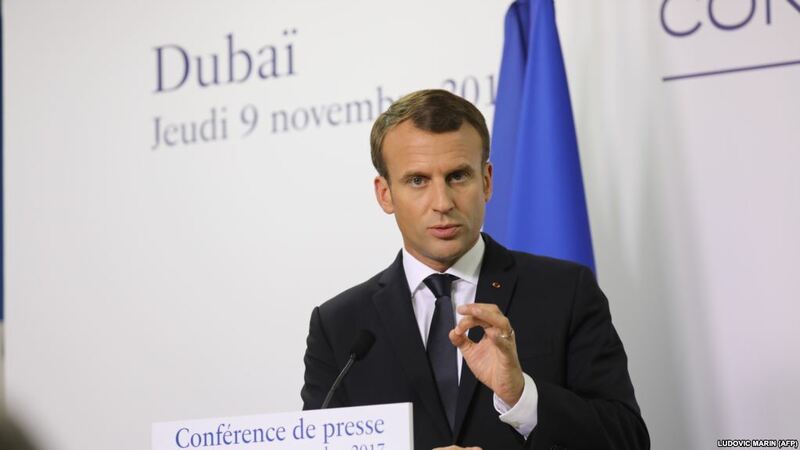 “The missile which was intercepted by Saudi Arabia launched from Yemen, which obviously is an Iranian missile, shows precisely the strength of their” program, Macron said late on November 9 as he visited the United Arab Emirates and Saudi Arabia. “Like what was done in 2015 for the nuclear activities, it’s necessary to put a framework in place for Iran’s ballistic activities and open a process, with sanctions if needed, of negotiation that would enable [an agreement],” he said. Iran has denied providing ballistic missiles or other weapons to Yemen’s Shi’ite Huthi rebels, and says its missile program is purely defensive. Iranian state media did not immediately report on Macron’s remarks. But Macron said “we need to have a truthful dialogue” with Iran. “It’s not about showing any naivety towards Iran, it is about standing beside our allies, in particular the United Arab Emirates. But it is also about not having a diehard policy that could create imbalances or even conflicts in the region,” he said. Macron met with Saudi Crown Prince Mohammed bin Salman later on November 9 and “expressed France’s condemnation of targeting Riyadh city by a ballistic missile,” according to the state-run Saudi Press Agency. “I believe it’s important that we work with Saudi Arabia for the purpose of guaranteeing stability,” Macron said. The United States backed the Saudis in blaming Iran, and raised the issue before the United Nations on November 7, calling for action to stop what it said was Iran’s illegal delivery of weapons to its allies in Yemen. Macron in his visit to the region appeared to be positioning himself as an intermediary — a role he has also assumed in trying to mediate disputes between Iran and the United States over the 2015 nuclear deal. Despite criticizing Iran over the missile launch, Macron said that France still stands by the nuclear deal, which puts restrictions on Iran’s nuclear activities in exchange for sanctions relief. “If we were to walk away from it, it would lead to either immediate war or an absence of control,” he said.